South Shields made it six consecutive wins as they overcame Workington AFC 2-0 to stay in the hunt for promotion. Robert Briggs calmly converted a penalty just before the break after captain Jon Shaw had been fouled in the box. Shields remain in second after Farsley Celtic also won. The in-form Nathan Lowe then sealed the three points with a free-kick that proved too powerful for Aaran Taylor midway through the second half as Shields maintained the pressure on league leaders Farsley Celtic, who beat Stafford Rangers 2-1 last night. Joint-manager Lee Picton had said after watching his side push Hednesford Town to the wayside on Saturday that the Workington clash would be a “different test altogether”. And a bobbly pitch prevented the Mariners from getting into their normal passing stride. The first real chance of the game fell to the visitors on 15 minutes, but Lowe’s snapshot was gathered by Taylor. Two minutes later the hosts nearly took the league for themselves. David Symington curled a free-kick over the wall from 25 yards on the left of the box, but it flew just past Liam Connell’s upright. In truth, it seemed likely that this contest would be settled from a set-piece, with both sides proving to be more dangerous from dead ball situations than open play. 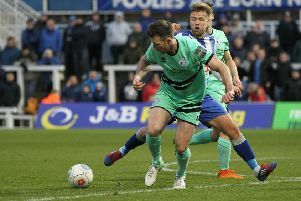 This time, it was striker Ben Harmison who came close as he connected with Phil Turnbull’s deep free-kick but it lacked any placement, allowing the keeper to make a routine save. Shields continued to pose a threat from set-plays. Turnbull swung a dangerous free-kick into the penalty area, and Shaw was hauled to the ground as he tried to meet the delivery. Briggs, who has been in superb goalscoring form this term, stepped up andfired home the penalty. Just after the break, shot-stopper Connell was called into action for the first time as he did well to get behind Dan Carmichael’s sweet strike from distance. Just as in the first period, set pieces seemed to be the more likely opening for both teams, so Lowe was presented with a great opportunity to extend his side’s lead as Luke Daly was fouled on the right hand side of the box. From 20 yards, he stepped up and powered a drive that proved to be too well placed and powerful for Taylor, who got a hand to it that was insufficient keep it out of his goal. From this point on, the Mariners looked comfortable as they saw out another vital three points. SHIELDS: Connell, Baxter, Adams, Shaw (c), Morse, Turnbull, Briggs (Lough 45), Lowe, Daly, Bell (Cogdon 84), Harmison (Mason 71). Meanwhile, Hebburn Town Reserves returned to the top of the Wearside League table with a 9-1 hammering of West Auckland Tunns. Dylan Nesbitt and Frankie Hucks led the way with hat-tricks and there were single strikes from Aaron Williams, Jack Young and Phil Gray as Kevin Bolam’s side wrapped up their biggest win of the campaign.